These Peaches & Cream Tartlettes were fantastic! Take a sweet, buttery tart crust with a hint of lemon zest and add a creamy filling of cream cheese and mascarpone cheese flecked with vanilla. Top this tart with sweet juicy peaches sliced and fanned over the creamy filling, then dusted with cinnamon sugar. Bake and voila!... 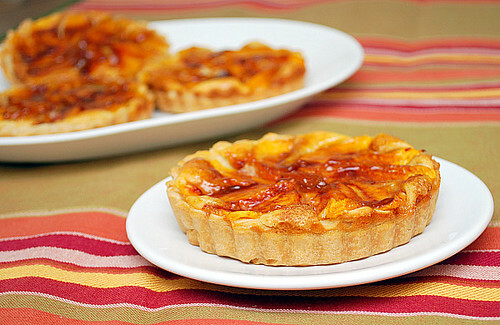 the result are these delicious Fredericksburg Peach Cream Cheese Tartlettes. It's hard not to love these, especially if you're enjoying the peak of peach season right now! Thanks to Tara for selecting this week's PPQ baking challenge. Hopefully others who tried this recipe enjoyed it as much as we did. In fact, I plan on making it again for an upcoming party and incorporating peaches and mangoes in the tart! Please check out Tara's blog for the detailed recipe and be sure to take a peek at fellow PPQer's to see how their recipe came out! The link to the recipe isn't working--could you post the recipe here?